How many people are publicly using Google Plus? The answer is: somewhere between 4 and 6 million. This is a rough estimation (based on Google’s profile sitemaps) done by Edward Morbius. There are about 2.2 billion G+ profiles. Of these, about 9% have any publicly-posted content. Of those, about 37% have as their most recent activity are comments on YouTube videos, another 8% are profile photo changes. Only 6% of active profiles have any post activity in 2015 (18 days so far). Only about half of those, 3% of active profiles, are not YouTube posts. 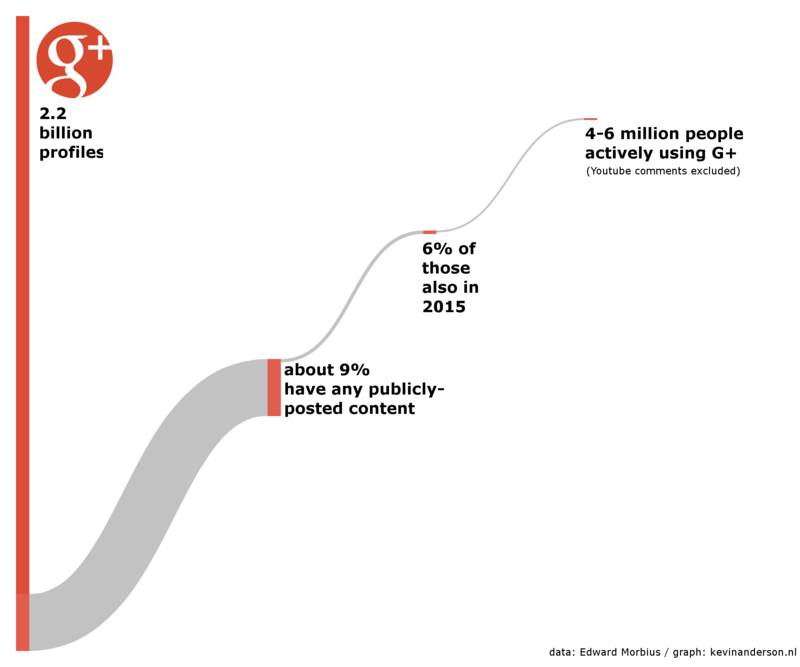 That is, 0.2% – 0.3% of all G+ profiles, about 4-6 million users, have made public post in 2015. You can find more on this analysis and the method he used in Edward’s Google+ post. There is one caveat: it does not include non-public posts or comments. The graph is a Sankey Diagram and was made with SankeyMATIC. [UPDATE] This post got some attention on Reddit, Business Insider, Slashdot, Boing Boing, Twitter and several other sites in Hungary, Greece, Poland, Brazil and again Hungary.